The 12th BT-Best Business Schools Survey, and the ninth partnering Nielsen, uses a slightly different methodology. Until 2010, the rankings were based on the institutes' Brand Equity Index, or BEI, scores, based on Nielsen's proprietary "Winning Brands" tool and derived from the results of a perception survey. This year's rankings, too, are based on scores obtained in a perception survey but did away with the BEI scores. The survey, which began in May this year, polled 1,732 stakeholders across 13 cities - Delhi, Mumbai, Chennai, Kolkata, Hyderabad, Bangalore, Lucknow, Chandigarh, Patna, Ahmedabad, Indore, Pune and Coimbatore (see the table below). Face-toface interviews were conducted with five different stakeholders - MBA aspirants, current MBA students, young executives, recruiters and functional heads, and full-time B-school faculty. For MBA aspirants, we covered students and working professionals who are planning to take the Common Admission Test, or CAT, and other MBA entrance tests in the next one to two years. The survey ensured a suitable mix of students with graduate and postgraduate degrees in professional and general courses. The current MBA group had a skew towards final-year students - in reputed B-schools. In the young executives group, those with two to four years of work experience were interviewed. Human resource managers of organisations that have been recruiting from B-schools for the past three years were interviewed. Similarly, functional heads who have headed a function for the past three years and been involved in the recruitment process of their teams were considered. Finally, we introduced a new but critical stakeholder group this year, full-time B-school faculty. Step 1: A shortlist of the top 60 B-schools was prepared using previous BT rankings as well as other sources to identify some of the new B-schools. As is our practice, B-schools which offer one-year professional MBA programmes were also included in the initial top 60 list. Step 2: The stakeholders were asked to rate the B-schools on a 10-point scale on parameters such as overall reputation (all five stakeholders), willingness to join (MBA aspirants), willingness to recommend (young executives), willingness to recruit (human resource recruiters and functional heads) and competence of faculty (B-school faculty members). In order to remove bias, the stakeholders were not allowed to rate the B-school they were directly associated with (studying or teaching). Step 3: A total score was obtained by combining the scores from the above parameters. The highest overall score was then assigned - a score of 100 - and the scores of other B-schools were indexed to 100. These indexed scores were then used to arrive at the final rankings. 1. Which B-school is your favourite? 2. Which one will you recommend? 3. What price premium are you ready to pay for that B-school (on a six-point scale)? 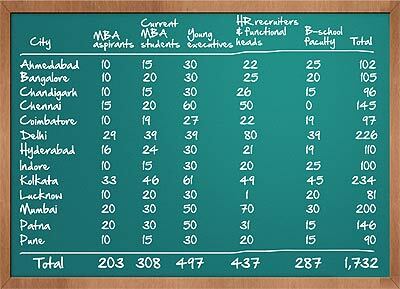 The MBA score for the top four to five B-schools used to be much higher compared to the remaining schools. In addition, the difference between the BEI scores of the remaining B-schools was marginal - often, a few percentage points. For instance, the gap between the B-school ranked 10th and the one ranked 30th would be, say, 0.3. As a result, even a minuscule variation in the score would make a big difference to the ranking. In the new methodology, the differences are not so fractional, the scores obtained are distinct, and there is a clear demarcation in the ranks. The Nielsen team which conducted the survey included Umesh Jha, Director, Client Services, and research executives Vinod Yadav and Rohini Tripathi.